While attempting to build a web cam mount in one of my other blogs I realized that I did not have the tools or the resources for a legitimate solution. Looking around the Internet a bit revealed no company willing to prototype small quantities of anything at a small price. This is when I started wondering whether creating my own rapid prototyping device was within my reach. A quick Google search shockingly confirmed the positive! 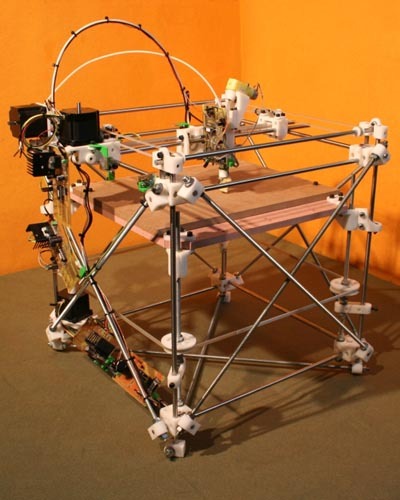 This brings us to the RepRap or the Replicating Rapid Prototype Machine conceived by Adrian Bowyer. Below is a picture of the Darwin, first iteration, model. Image can be found at RepRap.org. Since their website is top notch I will not attempt to rehash the purpose of the project. Let us just say that it has a print head that can extrude plastic while moving in three dimensions. This allows it to build up layers of plastic into a 3D object that is accurate up to 0.1 mm (in theory).